Editor’s note: During each Chips Quinn orientation and multimedia training in Nashville, Tenn., in May, scholars are required to complete a multimedia reporting assignment. Their work is displayed here. NASHVILLE, Tenn. – Music spills from the room whenever someone opens the glass doors. Hi-hats, drums and guitar riffs play in a loop as students try to keep up with the rhythm on a digital keyboard. When they lose the beat, Jarrell Pierson steps in and catches them up. Pierson is the music production mentor for Southern Word, an organization that uses the literary and performing arts to build skills in young people. He works at half a dozen library locations to teach students how to produce audio, record sound and write lyrics. 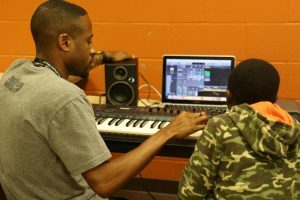 The Cypher program emphasizes collaboration among participants, who range in age from 5 years to the mid 20s: The students work together to write lyrics, create a beat and produce a song. The highlight of Pierson’s eight years with the program is having introduced hundreds of students to a side of music they’ve never experienced before, he said. His students reconnect with him after they’ve started releasing records and albums, he added. Carlos Shivers, manager of the Edgehill Branch library, has been involved with the program for nearly four years. Antonio Jefferson, who raps under the name “lil 80’s,” has been rapping for most of his life but first became involved with the production side of things through the Cypher program. Southern Words operates the program with financial support from Nashville Public Library Foundation. Southern Word started more than a decade ago to promote literacy in schools, but has expanded to offer other kinds of programs. This entry was posted in Chips Quinn Scholars and tagged 2018 Summer by Colleen Fitzpatrick. Bookmark the permalink.